What's All the Fuss About Aereo? 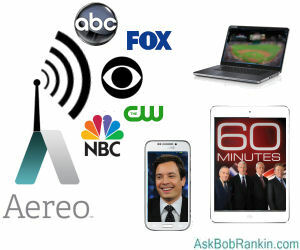 Aereo is a service that records local over-the-air (OTA) television broadcasts, and streams them (either live or on-demand) to your PC, tablet or smartphone. If you have a Roku or Apple TV box, you can even stream to your TV. Aereo is trying to take advantage of an apparent loophole in copyright law. Consumers are permitted to record free over-the-air TV broadcasts for their personal, non-commercial use. Aereo rents to consumers the use of antennas, data center storage space, and other infrastructure to do this, and provides access to stored content via the Internet. The company claims its business model is not prohibited by copyright law. The production studios and broadcast networks beg to differ. They argue that Aereo is recording copyright-protected content and reselling it to consumers without paying license fees to the copyright holders. Producers get no revenue from Aereo, and broadcasters are placed at a competitive disadvantage because they must pay producers for the right to rebroadcast TV content. Is Aereo's Business Model Legal? Aereo has argued that what it does is no different from what many other cloud storage services do. If that is the case, then a ruling against Aereo would implicate a wide range of other cloud services in copyright infringement. That’s what has the pundits and some cloud industry execs clutching their pearls. But the worry-warts seem to have forgotten the law, or are ignoring it to bolster Aereo’s case and open a whole new market for themselves. Dropbox, et. al., are protected against claims of contributory copyright infringement by the Digital Millenium Copyright act’s “safe harbor” provision. Essentially, that provision assumes that the storage service had nothing to do with the creation of an infringing copy of a work, and so the storage service should be held blameless if it takes prompt action to remove infringing works from its servers when copyright owners complain. But Aereo has everything to do with the creation of the copies stored on its servers; that is a significant distinction. It is not charging just for storage and access; it is charging for the capability to make a recording. If Dropbox storage service included the ability to make copies of copyright-protected software, music, etc., then Dropbox would be liable for contributory copyright infringement (even if the resulting illegal copy was not stored on Dropbox). That leaves Aereo with the argument that it’s perfectly legal for consumers to record free TV and store their recordings wherever they wish: on their own at-home servers, in a safety deposit box, or on Aereo’s servers with the ability to access their recordings via the Internet. It certainly shouldn’t be illegal to help someone perform a legal act, even if you charge $8 a month for your help. Even the Justices seemed bemused by these conflicting perspectives during oral arguments on Tuesday. “What disturbs me on the other side is I don’t understand what the decision for you or against you when I write it is going to do to all kinds of other technologies,” Justice Stephen G. Breyer said. A win for Aereo would be good for consumers, in the short run. In the long run, it might be bad for consumers if TV producers have less financial incentive to produce content or if broadcasters drop free over-the-air broadcasting. Already, some networks have announced intentions to move to subscription-based cable channels rather than compete against “pirates” like Aereo. Most recent comments on "The End of Free TV?" It seems to me that Aereo has found a loophole but I'm not a lawyer. I think overall that the broadcast stations should be reimbursed for providing the content, but I wouldn't care if their incomes were reduced to cut down on the ridiculous amounts of money Hollywood is making. It's crazy that actors should be getting between 1 and 2 million PER episode of a half hour comedy and that's not even talking about the salaries for the network executives that foist the mostly crap programming on us. Broadcasters such as Fox have threatened to pull their on-air broadcasting if the Supremes uphold Aereo. Personally I would like them to follow through on their threat and stop on-air broadcasting. According to NAB 17.8% of USA residents get their TV content OTA. So go ahead, go off the air. See how it works for you. To Harold: Do you think that personal DVR's, DVD recorders and blank DVD's should be illegal also, since they are produced by manufacturers and are sold to consumers such as ourselves for a profit? The sole purpose for each item would be to watch programs time-delayed and on demand as you put it. The only difference would be a large, up-front purchase of the equipment instead of a low monthly charge over a subscription period. OTA Braadcasters are complaining for the simple reason that they are charging cable/satellite co's a lot of money to broadcast their signal, something they would lose if Aereos wins. Cable/satellite did not use to carry local channels; one had to have an antenna to get them. OTA Broadcasters got together and lobbied Congress to FORCE them to carry their channels. Then, they decided that was not good enough, so they started charging cable/satellite companies for the privilege of carrying their signal, which by law, they had to do. Now, they are fighting Aereos because they will lose the fees generated. I have no love lost for OTA Bradcasters, cable or satellite. They are all crooks overcharging for the value of their content. Actually a lot of shows and movies when recorded when played back have fast Forward, Reverse and the replay features disabled. Also some Cable only shows do the same. Remember when people used to listen in on Cordless phones and scanners and were arrested for doing so. If it were legal then the law could have used that the airwaves were public and could be monitored. I'll stick to cable record what I want to watch at my convenience and delete when done. The Broadcasters are right . Aereo is recording the broadcasts ... then transferring them to other people ... that is illegal. even if its for free. "Free TV" ended the day the gubmint stole the analog airways and forced all stations onto digital service. They also put every individual anywhere in range of an Atlantic/GoM hurricane in greater risk with the same move. EDITOR'S NOTE: I don't understand. With a digital-to-analog converter, you can get the same free TV stations. And hurricanes... what? In the early ‘70s, there was a very exclusive club called "The Hooligan B*st*rds" and in their meetings, they would come up with novel "Shenanigans" to stiff the John Q. Public in the wallet to the maximum extent possible. This Hooligan B*st*rds club was originally started by a few fat cats that chomped on big expensive cigars with their expensive Guiccis on mahogany desks. The Hooligan B*st*rds were called the RIAA and they would throw fits and tantrums that starving musicians were being trolled by John Q. Public (JQP). Over a decade, they came up with weird Shenanigans in attempts to force JQP to pay EACH time they listen to any song. In the early ‘80s, when the CD music was introduced, the Hooligan B*st*rds upped their Shenanigans and colluded to fix prices of recorded CDs, to stiff the JQP in the wallet again. In the early ‘90s, when the digital-age kicked in high gear, JQP figured out alternate means to listen to music (via MP3 files) au gratis. Hooligan B*st*rds were forced to open their exclusive club to the Movie Moguls (aka MPAA) in an effort to escalate their shenanigans against JQP. They cried wolf to anyone within earshot distance and took their whining all the way up to the US Supreme Court. All the while JQP was still getting royally stiffed in the wallet, and the ‘starving artist’ continued to starve but the Hooligan B*st*rds were still rolling in money like a bunch of happy dough-boys! Just before the turn of the century, the Hooligan B*st*rds roster included the software manufacturers and the next salvo against JQP was the Digital Rights Management (DRM) Shenanigan. The fight had to escalate in the millennium decade (the ‘00s) and parts of our government were invited into the Hooligan B*st*rds club as the mercenaries for RIAA/MPAA. First, they opened the membership to FCC that was originally created to defend the airwaves for the people, but their shenanigans allowed them to parcel off the “FREE” RF spectrum to the highest bidders and raked in billions on the sale of the airwaves that were supposed to have been for the JQP! Then, the Hooligan B*st*rds started luring the politicians into their Shenanigans with campaign contributions. DRM was followed by Digital Millennium Copyright Act (DMCA) and JQP was now treated like a felon by the FBI. So, here we are in the decade of 2010s, and the Hooligan B*st*rds have escalated their Shenanigans to viral levels with SOPA and “Net Neutrality” and the “Six Strikes” (BitTorrent) fights. The Hooligan B*st*rds and their Shenanigans are not going to end any decade soon thanks to JQP being a resolute bunch! Wooot! I use an HD capable entenna on the roof to bring in all the channels I need, it is free. We pretty much lost "free" OTA TV shortly after the big "New Improved" digital TV started. I live almost smack-dab halfway between two major metropolitan areas, let's call them City C and City M. Back in the days of analog TV I probably got close to 60 channels coming out of both cities. After digital, the number dropped to about 30 OTA channels. Over time more and more TV stations "vanished" including the main ABD, NBC, Fox, and CW stations. No longer get them. Right now I can only get CBS from City C, Fox from City M, PBS stations (sorta) from both, and a smattering of local Spanish or religious channels. So now the only way for me to get TV is learn to live with the handfull of still-availabel broadcast stations, *pay* for cable and/or *pay* for internet so I can stream. Even with Aereo I'd still have to *pay* for internet service to get access to my "cloud DVR." So "Free TV" is essentially dead already. And I actually agree with Aereo in one regard. What's so different from me recording OTA TV on my DVR/VCR? Or using a cable provider's DVR (which in some cases you rent from the provider)? I've heard tell that few people actually watch TV when it's originally broadcast. Most apparently use some sort of video recorder to time shift. And skip the commercials. No dif. Aereo can rebroadcast all it wants as long as all the commercials cannot be omitted or fast forwarded. Exactly like the commercials which appear before videoclips offered everyday from CNN, BBC etc. Now where should i send the bill for my Million dollar Arbitration fee? Don't know if this is legal or not, but one other thing to consider is that not everyone has unlimited high speed internet. I have high speed, but pay by the Mb so streaming TV is out of the question, for me. I have to say that the broadcasters don't seem to be forthright why they're against Aereo. I think that it's because people will drop their cable suscriptions and thus deprive the broadcasters of the fees that the cable companies pay. Not that many consumers receive on-air broadcasts now-a-days. Why don't we all just take a week away from the television. Go out and enjoy life, take that vacation. No one sees a program, no one sees the commercials and producers sees no revenue! Take that to the bank, Oh, you can't, no revenue. Oh well. Thanks to RandiO for the extremely well thought out and VERY accurate comment! It explained, very clearly, exactly what's happening. Haven't read all the comments but I've been waiting for AEREO. My woman pays Dish and we played the switcheroo game between Dish, Directv, and Comcast. Receive OTA channels? We're in a valley, canyon? with the mouth aimed in the wrong direction to receive OTA. I considered going back to the free? large dish satellite. But there's not much programming available there and equipment is not cheap. Internet? 2 choices. Tried the Comcast, Verizon switcheroo. Stuck with the cheap Verizon dsl. Barely streams netflix. Especially since net neutrality disputes. Buffering. Youtube? pretty much unwatchable. And celebrities salaries? Ludicrous. Same as athletes salaries and CEO, COOs. Face it if you don't pay for tv, it won't be. Here we go again. When I first got cable (no internet) in the 80's sometime it was 15$ a month. Now its 130$, including internet. so 8 bux today is probably 50$ tomorrow, or even more! And you know the gov't will find a way to get a big chunk of change for themselves off such a lucrative opportunity. Hope the Court squashes the whole thing. In the long run I'm sure it will be better for all of us. In all honesty, too many of us, actually lost our "Free TV", back in the 1950's, when TV reception was not available or next to impossible to receive and small Neighborhood Antenna Sharing, the start of Cable, came into being. In the 1950's, I was living in the Los Angeles, CA area and my Mom got a B&W 17" TV. She paid someone to put up an antenna, to get the local stations. On good days, we could get almost all of the local stations, which totalled to 5 ... CBS (2), NBC (4), ABC (7), KTLA (5) & KTTV (11). Please, note ... All of the original TV stations, in the LA area, are still functioning to this day! There are lots of hills surrounding the LA Basin, which means, that they interfere with reception. So, on "bad days", we frequently got TV channels, from San Diego, CA, which is about 250 + miles, from our house. Bottom line, a few of the neighbors, got together and purchased a HUGE powerful TV antenna, to share. Some form of "cabling" was used, to go from the huge antenna, to their houses. Monthly charges were set-up, to "offset" any costs of the TV antenna and it was shared equally, amongst the "owners." For me, that was the "start" of Cable TV. By the 1960's, more and more TV stations were added and it honestly, became impossible to get all of them, in the LA Basin. So, someone bought out the local "Neighborhood TV Antenna" sharing "business" and for the LA area, that was the beginning of Cable!!! How can you sell something that does not belong to you? I'm in favor of the aereo argument. They are doing nothing illegal. They are following the law. If the broadcasters want to drop ota broadcasts they'd only be hurting themselves. If tv dies, so what?! It's mostly garbage. Who needs all the social engineering on tv today. I think we'd all be in better shape if most of entertainment television disappeared. There's more reader feedback... See all 39 comments for this article.